Yellow lines are used to separate traffic moving in opposite directions. Solid lines indicate that drivers are not permitted to pass. What is a "No zone?" "No zones" are the large blind spots around trucks and other large vehicles. Drivers of smaller vehicles should avoid lingering in "No zones." Who is required by law to use a fastened safety belt in a moving vehicle? Colorado’s safety belt laws require a fastened safety belt to be worn in all motor vehicles on public roadways by the driver and passengers in the front seat. All children between the ages of 8 and 18 are also required to wear their safety belts, regardless of where they are seated in the vehicle. Keep to the side indicated by the arrow. You may drive in the left lane. This is a "Keep right" sign. 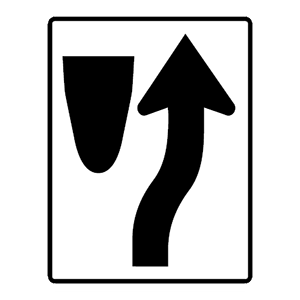 It indicates that a traffic island, median, or barrier is ahead and that drivers must keep to the right of it. Adjusted to sit above the head. Anywhere, as they have no effect on the driver or passengers. Head restraints should be adjusted so they contact the back of the head. This can help prevent injury during collisions, sudden stops, and sudden turns. Warning signs prepare drivers for upcoming road conditions and hazards and are usually yellow with black markings. 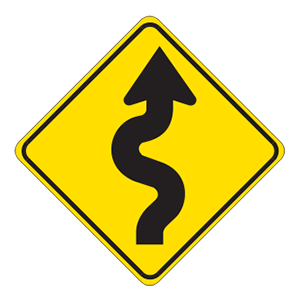 This sign warns drivers that they are approaching a winding road and that they should adjust their speed accordingly.